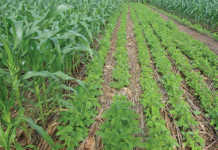 Much attention should be given to planting bean seed as carelessness at this stage can be very costly. We have dealt with spacing but the depth of seed placement is also important. Seed planted deep is usually in a zone where the moisture level is more constant, which can lead to more even germination. However, the seed will require more energy from its reserves to emerge, which can be a problem with seed lots that lack vigour. There is also the chance that a heavy downpour will compact the surface and possibly form a hard crust, exacerbating the problem. A further problem in soils that are inclined to form a hard crust is the need to irrigate lightly to soften the crust for emergence. This produces a semi-anaerobic soil situation and many soil-borne fungus diseases are likely to develop. In such soils it is safer to plant shallowly and give follow-up light irrigation until the root is established. The ideal is soil that is moist enough without immediate irrigation to stimulate germination. Seeds like moisture with plenty of oxygen. 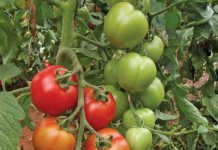 If there is heavy, steady rain after planting and before the seed has started to germinate, many of the seeds may rot. If there is a chance of this happening, plant as shallowly as possible. Well-aerated soils and those with a good organic status are far less likely to have this problem. 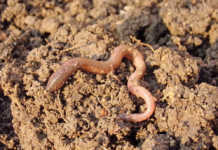 In these soils, seeds can emerge in five days. Although bean seeds are relatively large and can germinate fast and easily, they can be surprisingly sensitive when conditions are not right. It is not worth planting when conditions are on the cool side, as germination will be delayed and the longer it takes, the poorer and more uneven it will be. Many weedkillers can also stunt plants that are planted in cold conditions. Precautions are also needed in very hot conditions. If the soil is dry and hot at planting, it can delay emergence, kill off some seeds and cause bald plants to develop. Again, emergence will be very uneven. If the soil is too hot to walk on comfortably with bare feet, rather wait until late afternoon when the soil cools down and then irrigate before planting. Learn from others’ mistakes to stay ahead of the competition. ([email protected], or (016) 366 061).